So this was posted at my kid's school. 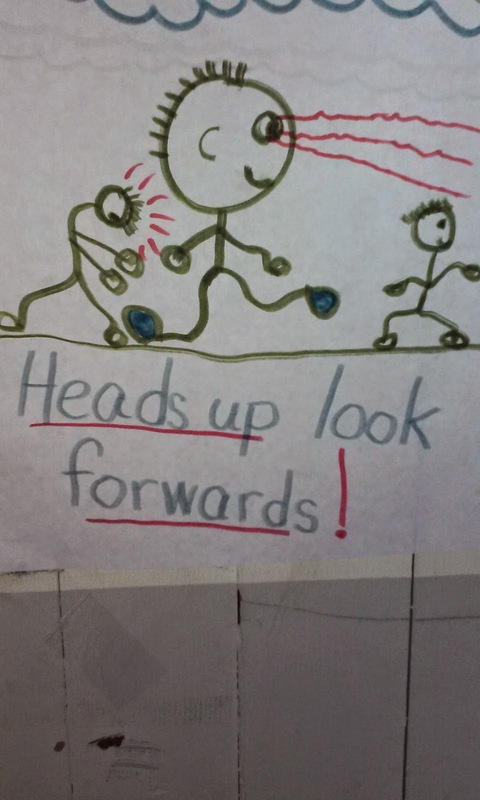 It's supposed to be a warning to keep your head up when you walk, but the visual says something other than the words. The words say Look Where You're going. The visual clearly says "OMG, there's a Monster with LASER BEAM EYES Behind you! RUN AWAY!" Or maybe it says, "LASER BEAM Guy already got Freddie. Run Faster!" I guess this one goes directly into the cautionary files. Be sure your graphics really say what you're trying to say. Or, you know, Laser Beam Guy is coming for you! Maybe that's Cyclops teaching young mutants to be X-Men? Hehehe. Thanks for the laugh. Have a great weekend! Those red squiggles do look like laser beams. Haha! I like your rendition way better. So much more exciting!